The T25 AT is an American tier 7 tank destroyer. The vehicle was developed based on the T23 tank, but the work on the project was discontinued at the concept exploration stage. The Command of the United States Army did not like the electric transmission and poor gun traverse limits. The T25 AT leads to the T28. If you have played the Jagdpanther, you will find they play fairly similarly. 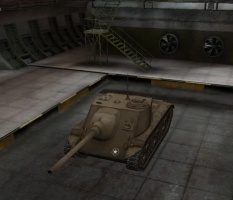 The T25AT is a tank that can do several jobs decently well, but is not truly a master of any. The tank is great for locating to an excellent spot in which is can provide sniper support, as it's 105mm has both good damage and penetration (though aiming for the sides of tanks is still highly recommended). But with tanks such as the Hellcat in similar MM, those spots may get taken before you get there, forcing you to move on to possibly less-then optimal locations. The tank is a good urban brawler and flank tank. It's speed and acceleration, combined with its high maneuverability allow it to quickly relocate behind the enemy to attack when their attention is drawn to the heavies and mediums in front of them. Again, though it maybe good at this, other lighter tanks, especially with turrets are better in this respect as they don't need to traverse the entire corner to shoot, thus reducing the opening the enemy has to fire. Due to it's very nice gun depression, the tank makes an excellent hill shooter. On maps defined by their hilly terrain that can be driven up and shot over, the T25AT (thanks in part to it's powerful engine) has no problem climbing these hills to quickly pop over and shoot with it's gun aimed full down. Once more, while the tank does well in this regard, it unfortunately means exposing itself to enemy fire that if the driver isn't quick enough, and with it's lack of armour, can mean being severely damaged. The tank can be an excellent end game hunter and scout. 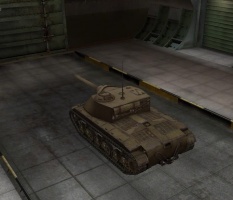 Whether the enemy team has only its SPGs left, or has a few speedy and pesky lights and mediums, either scooting around or pushing a base cap, the T25AT can hold its own very well in terms of speed as the driver tries to find them and mark their locations known to their team, and with firepower that outshines many mediums and lights at it's tier, can also quickly finish them off. But again, with speedier light tanks and mediums with potentially better armour should a firefight ensue, there sits the potential for the tank to be out-maneuvered and over run, there are again better choices that can be had. 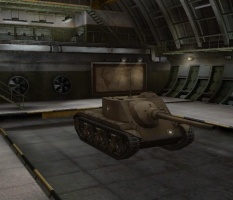 The T25AT's combination of speed, gun depression, firepower and maneuverability make it a tank that shouldn't be taken lightly by people facing off against one, yet it's lack of armour and turret mean that it's also a tank that can be exposed to great risk and can easily be exploited by those attacking it. Players must be aware of the tank's limitations so as to play the tank to its fullest -a well played T25AT can easily do upwards of 1800+ damage a match- but at the same time not let the limitations hold them back from fully utilizing its strengths to their advantages. The lack of a turret -usually the biggest complaint lodged against the T25AT- should not deter anyone from picking one up and playing it, as the T25AT is one the most rewarding and fun tanks in the game. N.B. 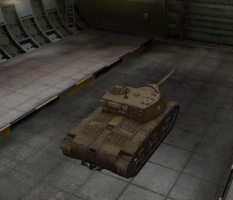 The 105 mm gun is also used on the T28 Prototype. Unlocking it on the T25 AT will make the grind on the T28 Prototype much easier. 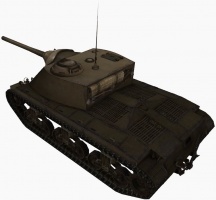 The T23 medium tank was a development of the T20 medium tank, with a Ford GAN V8 engine with electric transmission. The T20 medium tank would eventually develop into the M26 Pershing. 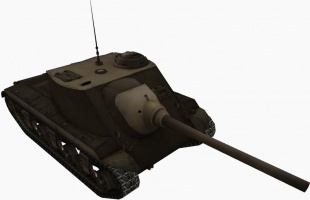 The T25 tank destroyer comes from 1943 models of a T23 medium tank chassis mounting a modified version of a 90 mm AA gun which eventually became the M3 90 mm gun. The wooden model upon which the T25 AT is based, described in Pershing: A History of the American Medium Tank T20 Series as a T23 chassis mounted with a 90mm gun. T23 medium tank with vertical volute suspension. Note the similarities in the suspension with the T25 AT. 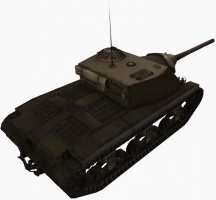 * The in-game model appears different from the wooden model, presumably to make the chassis and suspension more resemble the T23 rather than the T1/M6 that it does in the wooden model. The wooden model upon which the T25 AT is based was never named. The name T23 AT would have been more appropriate, as the vehicle is based on the T23 medium tank rather than the (American) T 25. The wooden model is described as having been fitted with a 90mm gun. There are no known plans to have mounted the 105mm gun on it. 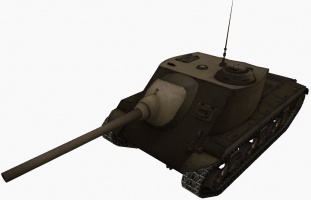 History of the T23 medium tank, upon which the T25 AT is based. This page was last modified on 1 September 2017, at 00:30.